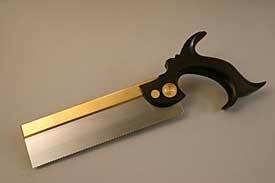 As requested, here is a photo of the Dovetail Saw which Mike made for me. It is very nice indeed and the handle is absolutely fabulous. Quite one of the most comfortable and well finished that I have ever seen. It is made from African Blackwood, requisitioned from his wife’s woodturning supply stash. Don’t know how he got away with that one….. The order turned into quite a complex saga, as some conveyor system in the mail mangled the first one. Mike then had to use much cunning and patience to get the remaining blank dry for the replacement. Rosewoods do not dry fast or easily and this really was quite a feat. So, many thanks to him and this is one of my most treasured tools. One day my sawing skills may catch up with the tool, but I am not holding my breath.